First things first the giveaway! 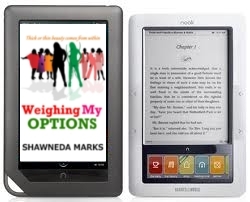 Sign up for my newsletter between now and August 31st to be entered into a contest to win a First Generation Nook loaded with all of my books including a copy of WEIGHING MY OPTIONS when it becomes available! If you're already signed up recommend a friend or write a for a review for one of my books and let me know you posted it and where. Second, I talked about it and researched it last year and now I'm giving it a whirl. That's right I'm doing a Seasonal Eat Clean Summer. It may not sound fun but it looks FANTASTIC! Third, Although summer has not technically begun yet I'm already practicing sowing. My first seed is obedience. God has spoken several things over me and for me to do and with the fresh infilling of his spirit and awesome power of the Holy Ghost I'm committed to doing them. It is one of my distinct pleasures and privileges to glorify Him and make Him smile. Are you sowing seeds to reap a great harvest in your relationship with God with me this summer?